Too many carrots from your garden? Have them for breakfast as a Coconut Carrot Oatmeal Bake. What can I say? I love cardamom and the citrusy flavor it gives to the cinnamon, ginger, carrots & apple. Like my other oatmeal bakes, this is lightened up with applesauce instead of butter, coconut milk and egg whites. I love the crunch from the walnuts and carrots, and sweetness from the raisins and apple. Oatmeal bake is a great meal prep and if you can use your over in the summer, you can still enjoy the end result hot or cold. Add a little yogurt and maple syrup for a deliciously easy breakfast. Is there anything better than banana bread in the oven? I was debating if I should go the peanut butter and chocolate chip route or honey walnut, and I settled on the latter (which just means I’ll have to save some bananas to bake up a new kind!). I loved the crunch of the walnuts and floral notes that the honey added. Whilst best straight out of the oven, the loaf freezes well to be enjoyed at a later date, like when you’re skiing up in Vermont. Using Soul Bee powered honey, this Honey Walnut Banana Bread is a fun take on your standard loaf. It’s that time of year! Time to break out the meal prep and healthy snacks and maybe some indulgences for those New Year’s resolutions. These Cinnamon Almond Bites are perfect for a quick dessert or a taste to satisfying your sweet tooth. I think they’re fine energy bites, and if you choose to coat them in cocoa powder or cinnamon sugar, they become a bitter, dark indulgence or a sweet one. I make them instead of protein muffins and enjoy with some a cup of coffee or with fruit/extra carbs to balance them out. Either way, have fun with these bite-sized energy bites! I love oatmeal bake. Originally made by my cousin, Betsy, when I visited Chicago, I’ve lightened up the original and made it my own. Last fall, I kept making a pumpkin version. This fall, why not try an apple version? I added apple pie spices, fresh apple chunks and chopped walnuts. Drizzle with maple syrup (which you can’t even tell I added to the pics since it absorbed right in), add a spoonful of vanilla yogurt, and top with raisins and cinnamon sugar, and Apple Walnut Oatmeal Bake will make your kitchen smell heavenly and give your tastebuds a frenzy. Plus, it’s such an easy brunch idea or a meal prep for the week. Happy brunchin’! This is actually like porridge! I’ve been a little oatmeal’ed and overnight oats’ed out, but after all these brisk mornings, I wanted something with the same feel. You may be skeptical when mixing together flaxseed and chia seeds and nuts and coconut . . . but it is! Trust me. I was surprised too. I popped this concoction in the microwave thinking it wouldn’t absorb the milk and become fluffy quite like oatmeal does, but the result is like steel-cut oats or cream of wheat — just less gnarly and grainy; this Grain-Free Porridge with Fresh Figs has a much smoother and lighter finish. I had the last of my fresh figs left, so naturally I topped porridge with those and the some dried cranberries for a late summer, early fall feel. Happy Meal Prep Sunday! Here’s an overnight oats recipe that’s got me through 5 am wake ups for clinical and kept me feeling full (in a good way) until I could grab a snack after 10 am or sometimes not until after noon. Peanut Butter Banana Overnight Oats are a sure way to make it through your morning. Plus, they’re your classic peanut butter and banana flavors with some walnuts for a crunch and protein power to keep you full. Confession: apparently I don’t have a square baking pan? I realize this every time I need one and never seem to remember to pick one up when I don’t. This explains as to why I baked my brownies in a pie pan and the pieces aren’t perfect squares . . . I made chocolate cookies using Greek yogurt before instead of butter and loved them. Like those, I made Greek Yogurt “Skinny” Brownies, which baked into dense, yummy brownies. These brownies are lower in sugar, low in fat (with the fat being healthier) and more nutrient packed if you use carob over cocoa powder. I tossed in some chopped walnuts and unsweetened coconut for texture. I was rationing my chocolate chips and would totally add more for next time! I’ve really wanted a true dessert versus just grabbing some dark chocolate pieces and/or some dates post dinner. I’ve been dreaming of some Halo Top ice cream on top of these brownies — stay tuned. It’s going to be amazing. UM, YUM! I stumbled upon Izy Hossack’s recipe for this Sweet Potato Bread and I’m beyond glad I did. Her site, Top with Cinnamon, is exactly what I love with cooking and food blogs: clean, simple and straight to the point. I tweaked her recipe and used whole wheat flour, added more spice and swapped the oil base. My only compliant is the loaf came out dense and did not rise very well, but this could be because I kept it true to Izy’s original, which is vegan. Despite not very much added sugar, the agave and sweet potato add just enough sweetness that’s accentuated by the spices. The nuts give the bread a hearty crunch. I whipped up a Greek yogurt spread to serve and the tanginess was the perfect balance. I can’t get enough of Banana Cookies. They’re simple — two ingredients simple, easy to make and the result is a tasty, yet satisfying treat. I was trying to find a way for a heartier snack that wasn’t celery and hummus or plain, ol’ raw almonds. I had bananas ripening on the counter, chopped nuts hanging out in the pantry and the idea to somehow incorporate a Kind Bar. Sounds promising, right? I tossed in chia seeds and dried cranberries and the Trail Mix Banana Cookies were born. I would have totally added dark chocolate chips, but I didn’t have any on hand. (Note to self, always have dark chocolate chips on hand. What was I thinking?) Sounds like I’ll just have to whip up batch numero duo and let you know how it goes. I’ve been dying to make some granola lately. ‘Tis this season and the aromas perforated my kitchen and spelled oh-so-heavenly. 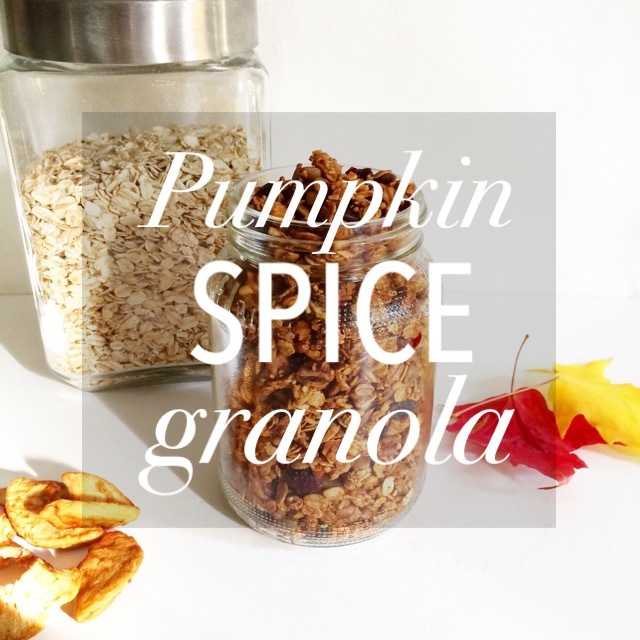 More specifically, I’ve been dying to make some Pumpkin Spice Granola. I have big plans for tho granola. I may or may not be resurrecting my yogurt breakfast parfaits to showcase some autumn twists. I’m thinking sweetly spiced pumpkin, some vanilla Greek yogurt and this pumpkin spice granola would go nicely together . . .